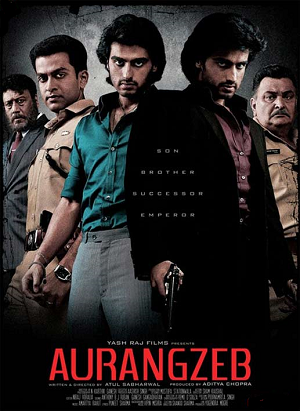 ‘Aurangazeb’ impresses with its sheer ruthless presentation without any artifice. There cannot be a better representation of the present day materialistic society. Atul Sabharwal with a group of good performers had driven home the message ‘Kingship knows no Kinship’ and also there will be some who will rise about that. Gurgaon of 2013 where political power and corporate currency play vital roles and the exclusive land grabbing art of India were brought to the fore contemptuously. The story is spun around the police officers who wanted to trap the powerful criminals for gain and not for law and order. DCP Ravikant’s (Rishi Kapoor) close knit family is pitted against the distraught business tycoon Yashwardhan and his arrogant son Ajay, his twin brother Vishal (Arjun Kapoor) and their mother Veera (Tanvi Azmi). The connecting thread of this unusual tale is ACP Arya (Prithviraj). The biggest favorable point of this thriller is its tight screenplay and best performances from all the lead players. For Arjun Kapoor it is a dream role; two diametrically opposite characters with similar looks. His handsome looks and committed performance should get him special laurels. South’s Prithiviraj is another surprise who executed his complex role quite convincingly. Rishi Kapoor now fits in any role he plays with professional touch. Jackie Shroff’s Yashwardhan is stylish. The biggest let down are the two young females Sashaa Agha and Swara Bhaskar. They neither have looks nor author backed roles. The acting credits go to all the yesteryear actors like Tanvi, Amrita and Deepti. It is superfluous to tell today the movie is technically superior. Yet Karthik Ganesh’s camera work captured the opulence and emotion with equal poise. If one wants to have entertainment with thrill, ‘Aurengzeb’ is the best choice.